Do you want to increase your sales, grow your profits or increase business performance to attract investment? Yes? I have the expertise to help. And it starts with a conversation. I focus on you and ways I can help train your sales people – because let’s face it – selling is hard. And no matter what business you’re in – professional services, manufacturing or retail – you need to sell WELL. And manage your sales people. What does selling look like in your business? Before I mention any of the proven steps I’ll help you take to grow your business I want to know: what does selling look like in your business? And why do I ask? Because before I can help you find new clients, sell more to existing clients and improve the performance and management of your sales teams, I want to know what you need. Are you ready to have that conversation? How do you feel about your sales performance? Cathy, MD of a consultancy in Edinburgh, was bidding for a public sector contract. But the focus of the tender document was all wrong. It didn’t reflect what the client needed. With my help Cathy re-wrote the tender and won the six-figure contract. Victor runs a Glasgow-based insurance firm. He sells insurance and competes with the online giants Gocompare.com and Compare The Market. But sales were in decline and his staff kept leaving. I’m helping Victor recruit, train and retain skilled sales people and now Victor’s business is growing. 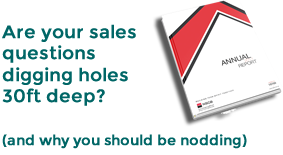 Are you troubled by a lack of sales activity and focus, underperformance or poor sales team management and morale? Tell me what you’re facing and I’ll lend my experience to define, set, monitor and evaluate your sales goals. I’ll deliver sales training specific to your needs. When you call I’ll ask you to meet for coffee. That’s it. All I want to do is have a chat and find out about your business. I’ll listen to what you say and a few days later I’ll offer draft suggestions on ways we can work together. I’ll also give you actionable feedback, often comparing your processes against those of top performing companies. Feedback you can take away and use with no strings attached. And yes, this all takes time. But it will be worth your while. Working with me can boost your sales, improve sales team performance and best of all, increase your profits. Would you like that? Call me now while increasing sales is on your mind, 07766 505 619.